Netanyahu arrives to visit neighborhood in Gush Etzion, 15 of whose homes were demolished following Supreme Court ruling six months ago. 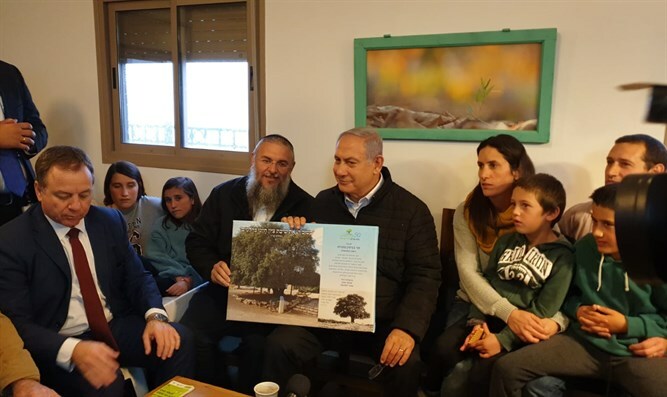 Prime Minister Binyamin Netanyahu arrived at the Netiv Ha'avot neighborhood in the Gush Etzion town of Elazar this afternoon, 15 of whose homes were demolished following a Supreme Court ruling six months ago. The Prime Minister's arrival was preceded in the morning with Gush Etzion residents being informed of an imminent VIP visit and told to expect consequent local traffic jams. Later word spread that the Prime Minister himself would be visiting the area. Netanyahu arrived as rains began to fall and fog as thick as mayonnaise started to envelop Gush Etzion, about 3000 feet above sea level (600 feet higher than Jerusalem). He was introduced to the town's rabbi, and remarked how he had hoped for a sunny day to mark the visit, apologizing for the delay. During the visit, Netanyahu said: "What has fallen shall yet arise. It's ours, we're building here. You live here. We didn't return from a journey of thousands of years for us to be uprooted. We shall plant and increase." 15 homes built it Netiv Ha'avot, part of the Gush Etzion town of Elazar south of Jerusalem, were evacuated following a Supreme Court decision in December 2016 ordering the neighborhood's demolition after a disputed strip of land was found to run through them.